BIG NEWS: The BCRF Fundraiser last week was hugely successful! I promised to donate $1 per comment and $1 per pin…the total is $359 so I rounded up to $500. Because $400 just doesn’t sound as round, ya know? This one goes out to all my fellow chocoholics! 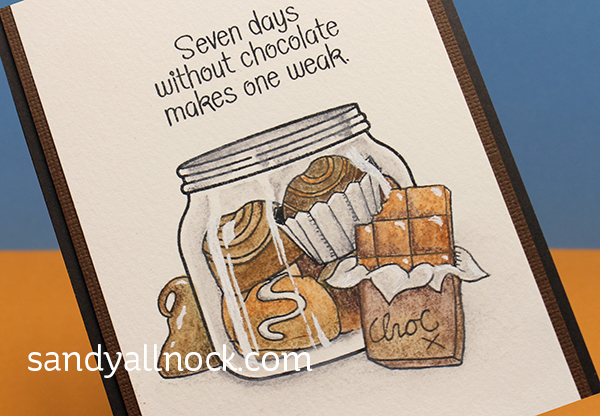 I’m one of those non-discriminatory chocolate lovers…I love it all! Milk, dark, specialty….yum! 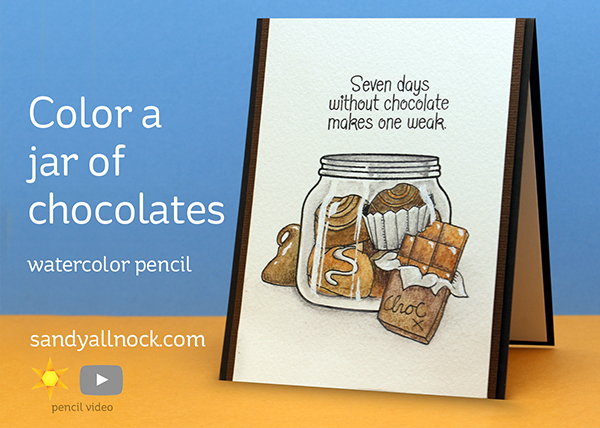 And this video will show you how to color your own jar – it’s a little lighter on the waistline than the real stuff. LOL! Watch the video below or click HERE to see it in HD on YouTube. And the sentiments in this set? Worth the purchase alone. LOL. I don’t wanna be weak, ya know. Expression is not Indescriminate chocolate lover but ‘ democratic chocolate lover’! Love this and the jar looks so real. The chocolates look yummy.. I love dark chocolate BUT I wont turn down chocolate.. I need to get both stamp sets. Well, you hit me right where I live… yummy chocolates! Thank you for your fantastic inspiration! These chocolates look so real! And I LOVE that sentiment! Awesome donation! You are so kind! Love your chocolates!! Dive Sea Salt Caramels—yummmmm—-are my favorites! Duh auto correct! Dove brand chocolate is what I meant!! Awesome job as always. You really like the jar. Sandy – Chocolate Monday! You’re my new best friend!!! These yummies will definitely be coming to play with me as soon as Ellen H. can get them to me!